Friends | Beat Up Shaun With Delight! Beat Up Shaun With Delight! What an Epic Fail really is. An Epic Fail is troublesome. It is embarrassing and often puts us in a very difficult position. What happens is that, we often go out and believe in something. And we work towards what we believe. In most occasions, we end up making a lot of mistakes, we get a lot of people angry. Relationships are hampered, wrong decisions are taken and a lot of things are compromised. In the end, you fail. A lot of things screw up and you alone are blamed for it all. That in my opinion is okay. Really. Because, what we have not realized for a long time is the fact that an Epic Fail can have a lot of things to its bright side. Failure is a very good part of our lives. It is rather important to have some amount of failed attempts at achieving something. If you’re doing something and have been largely successful at it, in your first attempt, then there could be some magical loop-hole that you’ve managed to establish in your favor. That is luck, a factor that I have found to be lacking a LOT in my life. Let me add that I have been responsible for some very good number of blunders. At the end of each blunders and failure, I have realized that I have even lesser friends and believers by my side. Which is good. Yes. Often, when you fail, you begin to realize that even though your friend circle has lessened to almost nothing, the ones you’ve left with are the ones that truly believe in you and will always stand by you, no matter what. And only such friends are the ones that you really need. I face this issue every time my attempt have gone down the drain. But at the end of it, I’m nothing more than grateful to the ones who have forgiven me and stood up for what I have believed. Also, Epic ails are funny and make good substance to laugh about later. So it doesn’t matter if you fail. It doesn’t matter if you have ended up penniless and every thing that you’ve done has turned up to be useless. You rather fail at something than be responsible for being nothing. Let it go and try again. You should know: What does not kill you, makes you stronger. Epic Fails are required. Epic Fails are inevitable. Epic Fails reminds you of your reality. 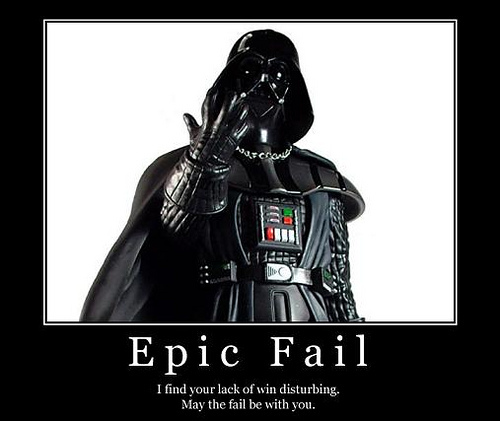 And most of all, an Epic Fail is epic. This track makes sense, right? Enter your email ID below for updates!